Paul Cornell's first Demon Knights collection was a frenetic, often claustrophobic romp in which the motley heroes tried to fend off the destruction of a small village. Though seven issues, I felt it read like one whole, and good, graphic novel. Though the second collection, Demon Knights: The Avalon Trap, essentially also tells one story, it is less cohesive and therefore feels less dynamic than the first volume. 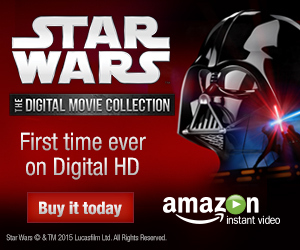 If the first book seemed like a graphic novel, this one is more like a collection of issues. Arguably not a lot of real import happens to the group in these pages, though in the main I still liked the book; it profiles a couple of key characters and also generally offers a taste of the supernatural not found elsewhere in the DC Universe. Aside from Vandal Savage, the Demon Etrigan and Madame Xanadu are the two characters who already interact with the "present day" DC Universe, and so the ones whose adventures are most likely to continue with Demon Knights's cancellation after the next book. 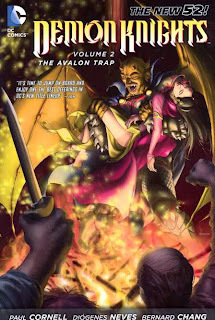 It's fitting, therefore, that Avalon Trap is mostly Etrigan and Xanadu's book; the first issue, before the main story starts, tells the story of Xanadu's romance with Etrigan's alter-ego Jason Blood; the conflicts in the main book relate to Xanadu specifically and serve to reveal her origins. Though I'm not sure there's much overlap between Demon Knights and DC's Justice League Dark, it serves their purposes that someone interested in Xanadu from Dark could come to Knights and find that character featured prominently. In that first issue, Cornell lets both Xanadu and Etrigan describe their romance from their different perspectives. Xanadu's would seem to be the truer -- that she's only dallying with Etrigan to help her true love, Jason Blood -- since Cornell gives her the majority of the pages in the issue. Etrigan's more base recounting seems the weaker, lasting just one page, and I admit some disappointment -- I more liked the idea of Xanadu with some ulterior motive, playing both Blood and Etrigan against one another for her own purposes, than to know she truly favors one over the other; I rather had wished Etrigan's account was somewhat true. At the same time, I felt Cornell demonstrated well the true curse of Blood's bonding with the demon; the night before Blood and Xanadu are to be married, for instance, Etrigan roasts the priest. Some more superheroic depictions of Blood and Etrigan have moved away from the Jekyll and Hyde core of the characters -- the two figures constantly undercutting one another -- and Cornell resurrects this well. Avalon Trap ends up in what I felt was a too-typical DC Universe-based Camelot story -- that is, the characters fight Morgaine Le Fey, something I feel I've seen too many times in Superman, Wonder Woman, and so on. Even as everyone else has moved on to Trinity War and Forever Evil, I admit I'm still eager to see how DC's mostly-abandoned Daemonite invasion storyline turns out, and my biggest thrill in this book was toward the beginning, when an apparent Daemonite murders the wizard Merlin. Unfortunately, the story turns to Morgaine and a betrayal by Etrigan that lands the team in Hell, and it doesn't much seem like Demon Knights is getting back to the Daemonites any time soon. What otherwise kept me interested in Avalon Trap, and will propel me to the third volume, was a good bit of nostalgia. In the Demon Knights fighting magic-altered beasts, in their being chained up in a creepy old castle, in their being transformed into monsters, I get the same vibe as when I read Bill Willingham's Shadowpact. Neither of these are the best iterations of the supernatural in comics, but they are good iterations of the supernatural in the DC Universe, and I like that DC has a title (short-lived though it may be) that's more fantasy than science-fiction, even moreso than the "modern horror" of titles like Phantom Stranger, Pandora, and Justice League Dark. I also get glimpses, in reading Demon Knights, of Gail Simeone's Secret Six title. The complexity of the characters in Secret Six was really something else -- even as we knew, I don't think we really knew what we had in our midsts. Demon Knights's characters aren't quite that complex, but as the Morgaine's magic transforms the characters into idealized yet monstrous versions of themselves, I see hints of this "deepness" -- Exoristos's self-loathing, the Horsewoman's mixed feelings as to whether she truly wanted to be free, and so on. Cornell's character work in this book, including the trials of Xanadu and Etrigan, is strong, and far stronger than what we've seen so far in other team books like Justice League Dark and Stormwatch. Demon Knights Vol. 2: The Avalon Trap does lose some steam after the first volume; at the same time, there's a lot I still appreciate about this series. Were it ongoing, maybe I'd wonder whether I might keep reading the series so closely; with only one more book remaining (and a big one, too, finishing Cornell's stories and collecting all of second writer Robert Venditti's stories), I'll see this through to the end. I also liked the first volume more than the second one but still I can´t wait for the 3rd volume (sadly the last one). I was a bit confused when I started reading the second volume, after the issue with the romance between Xanadu and Etrigan they didn´t show how Xanadu recuperated. at the end of volume 1 I thought that Xanadu was badly hurt in volume 2 they didn´t mention anything about it. Pretty sure that toward the end of Volume 1, Xanadu took some of the life force of the priest that Etrigan had already injured, in order to recover herself. Her injury had been that she'd cast a powerful spell that took years off her life, but with the priest's life force she was restored. no, what I meant was the battle with the other magician (sry forgot his name), it happens after Xanadu´s injuries are healed. the magician used mindrip against Xabadu and on the last page second panel we see Exoristos holding Xanadu and Xanadu seems to be unconscious.